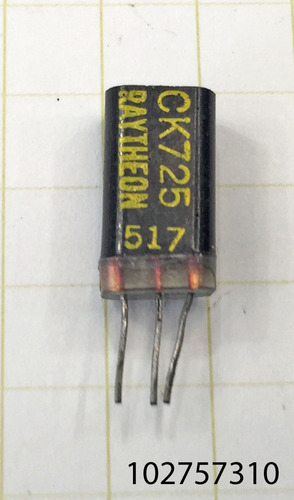 "Raytheon CK725 (1 piece), germanium PNP alloy junction transistor. Highest gain performing version of the early CK7XX product line. Raytheon continued to improve the manufacturing processes for these early 1950s germanium transistors, and this resulted in high gain performance characteristics for some types, such as the CK725, which was introduced in 1954 – the more robust metal case version of this transistor type was released by Raytheon as the 2N65. Date code: 517 (1955, week 17). Rare - especially with the unusual yellow stamped labeling and the1955 date code; black epoxy cases were abandoned by Raytheon in this timeframe to the more robust metal case styles."